Day 7 – A coastal challenge with the most rewarding views. The steep ascents and tricky beach walks into St Andrews. 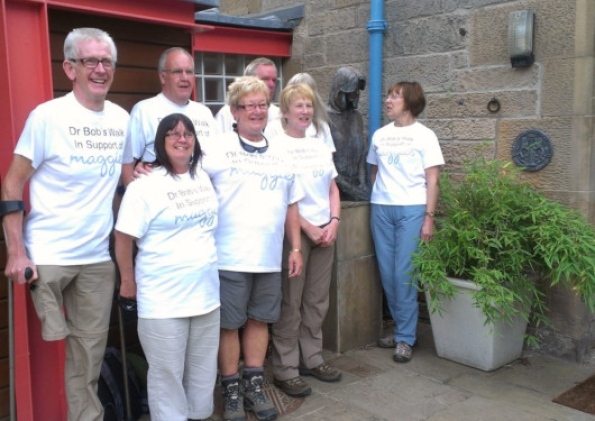 Dr Bob Grant and his fellow walkers are well on schedule to finish their incredible week-long walk at Maggie’s Dundee on Sunday. 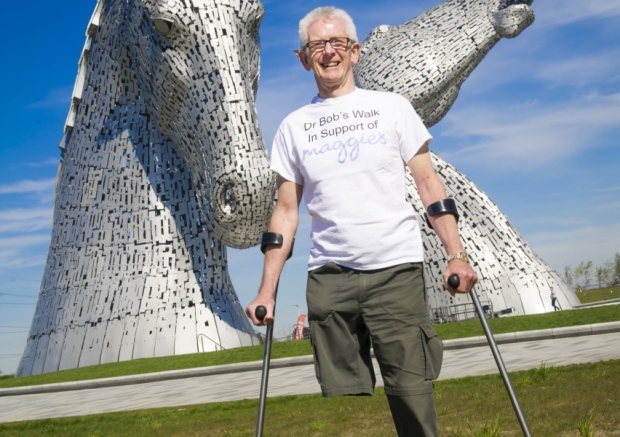 The Bob’s Walk group set off from Maggie’s Edinburgh on Sunday to trek the 108 miles along the Fife Coastal Path to help raise awareness of Maggie’s. Every single penny raised by the group will go directly to Maggie’s Fife. Speaking to The Press as the group headed out of Earlsferry at the start of day five, Bob praised the walkers and supporters who had help spur the group on. “It’s been a great walk so far and the support we have received along the way has been quite overwhelming,” he said. 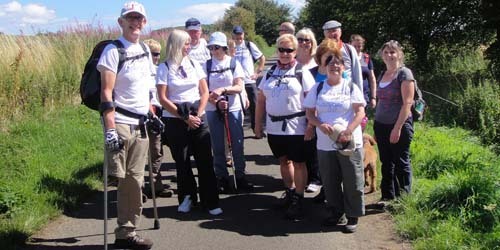 The group has been joined by fellow walkers and well-wishers along the way, around 20 per day, and have yet to be hampered by the unpredictable Scottish climate. Bob said: “The weather has been perfect; if you’d asked for ideal walking conditions then this is what you would get. “The only part that was a bit tiring was the stretch between the Kingswood in Burntisland and Buckhaven. That seemed incredibly long but then the coastline is so beautiful that you can just concentrate on the view and you forget all about it. “There were a few aches and pains on day two but they’ve gone now. As we went to press the group was heading for Pittenweem where a pop-up Maggie’s was set up as part of the Arts Festival, before heading for Anstruther for some well- deserved fish and chips! 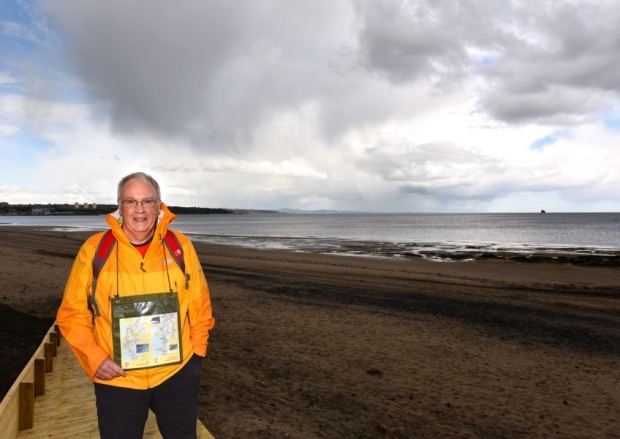 Fife Free Press Editor Allan Crow, who is keeping a blog at www.fifetoday.co.uk, has been with Bob every step of the way and says the walk has opened his eyes to the beauty of the coastal path. “What’s been great for me is that I’ve seen parts of Fife along the path that I never knew existed. I’m really enjoying it.” he said. A big finish is planned for Sunday when the group arrives at Dundee. The walkers will be joined by ultra runners Johnny and Sheena Logan, who plan to run the path in just 24 hours, plus up to 80 bikers from the Edinburgh Dunedin Chapter of the Harley Davidson owners’ group who will chaperone the walkers to their final destination of Maggie’s Dundee. Bob said: “I’m looking forward to a big day. A 13-mile walk through some of the most stunning views in the Kingdom, and a fabulous high tea at the end! Day five of Bob’s Walk delivered the hottest temperatures and arguably the finest scenery yet – a day in the north-east which took your breath away. We travelled from Earlsferry to Crail, through Elie, St Monans, Anstruther and Pittenweem;a fabulous journey which embraced wonderful views and the warmest of welcomes wherever we went. Our pedometer stopped dead on 13 miles as we arrived at the Golf Hotel in Crail for a fabulous high tea, and by then we had seen and savoured the Kingdom at its very, very best. Once again we were joined by new faces, old faces and community groups who took the number of walkers to over 20 for the third day running. The Rotarians from Anstruther & District were joined by Ken Wilkie, the man behind www.bobswalk.co.uk website, and fellow photographer and walker, Peter Grubb. The mile-walk from Earlsferry to Elie took no time at all, and the silence of the countryside was broken only by conversation and a number of plans flying low overhead on exercise from RAF Leuchars. The rural path leading to St Monans produced many photo opportunities – stunning landscapes as well as of the walkers as we started to split into small groups with our canine companions Fred and Amber zig-zagging back and forth and exploring more of the path than probably most walkers have managed! From St Monans we kicked on past the saltpans and the first of several once-popular old outdoor swimming pools, and along to Pittenweem where a pop-up Maggie’s Centre formed part of the festival and became our focal point for photos, and the presentation of a generous cheque from our Rotarian walkers. Tu Edwards was busy serving hot and cold drinks as we sprawled out on the grass for a very welcome break – the sun was just about at its peak, and we were all starting to feel the heat! With its arts festival in full flight, Pittenweem was a busy place as we headed down to the shore and on to Anstruther. Our apologies also to Eunice and Susan Thomson who had arranged a little welcome party for us along with Heather Cunningham- one of the participating festival artists – who we didn’t catch up with after arriving in the village via the top road. Our thanks, however for their support and very kind wishes – their pictures is part of our photo-montage from day five online at www.facebook.com/fifefreepress and www.facebook.com/bobswalk. We said farewell to some of our walkers as we headed out of Pittenweem along the coast to Anstruther which was soaked in summer sunshine, with every pavement table and bench filled by visitors and tourists. Our thanks to the people who gave so generously as we ventured along the front to the ice cream shop – Bob’s treat! – for a very welcome rest before moving on towards Cellardyke where there were old friends waiting to meet Bob. And then it was back into the countryside as the towns and villages faded and the path narrowed just yards from the shore. The second part of the walk was fabulous, but more challenging – the underfoot conditions were far from even, and the switch from stone to path to grass and back again every few dozen yards took its toll on tiring limbs. Thankfully the coos in the field were far to docile to investigate as we hauled ourselves over the stone wall and into their fields around the Caiplie Caves, en route to Crail where we climbed the last stone steps and began a wonderful descent to the door of the Golf Hotel. Huge thanks to the staff for their very prompt service despite us arriving at the same time – we were slightly late! – as a huge coach party and a very busy bar to run. The high tea was absolutely fantastic – toast, pancakes, cakes, and haddock and chips. A shorter distance – just nine miles – which will see us depart from the Golf Hotel, Crail, towards Fife Ness and Kingsbarns and on to our destination in late afternoon. Day 4 – Tuesday 6th August 2013. Buckhaven to Earlsferry. Fife’s coastline at its most beautiful & beguiling. That most relaxing of moments when you kick off your shoes, sit back and go … aahhh! We have to start our Day 2 blog with a huge thank you to the Kingswood Hotel in Burntisland for allowing us to kick off our walking boots and abandon them with our rucksacks, and then pad round their busy restaurant in our socks. The food was superb and the service excellent, and our thanks to all -including our fellow diners – who made us so welcome. The day was a joy from start to finish. The further we walked, the more people joined us – we ended up with over 20 people all heading through Burntisland. Their company was fabulous and made the day very special. It started at North Queensferry as we decided to head up the hill and into Inverkeithing – if you’re going to tackle a hill you might as well do it at the very start! We passed Gordon Brown’s house and enjoyed the first of many stunning views across the Forth as we climbed high up Ferryhills Road before turning down and into Inverkeithing. 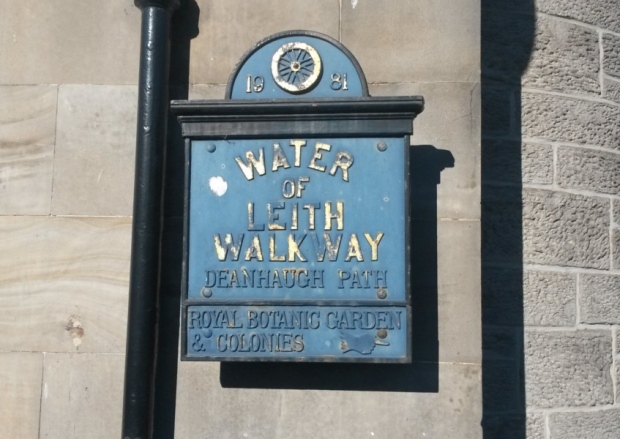 From the High Street we turned down towards the path, past the old railway line that once ferried thousands of Fifers to the dockyards. We stopped several times simplhy to admire the view – the Forth was tranquil and captivating, and we were able to study just how far we’d come as we looked across the water. Coming into St David’s Harbour we were joined by ramblers from west Fife who made the trek all the way to Aberdour. Before that we had a stop at Dalgety Bay Sailing Club which was buzzing with activity – again, sincere thanks to them for the warm welcome and use of their facilities. Refreshed and revived we set off for Aberdour just as the sun really started to burn through. Cutting through the grounds of Aberdour Castle, we were stopped by two old ladies who made a lovely donation to the fund – one of many we’ve received on the journey so far. Lunch was on the park benches at the Silver Sands where more family and friends joined us, along with a delegation from the Rotary Club of Kinghorn and Burntisland who accompanied us all the way to Burntisland. The walk along the side of the Forth whizzed past amid great chat, and it was fascinating to hear them pinpoint landmarks and tell the stories behind them. They also took us up to the Viewpoint – a fabulous attraction we would otherwise have missed. The views were stunning. From the noisy and excitement of the shows on the Links to the tranquility of the Forth, it showed Burntisland at its very, very best. Back down to the High Street we regrouped and made the final journey to the Kingswood Hotel. Total distance was circa 12.5 miles. Two days down and seven to go. 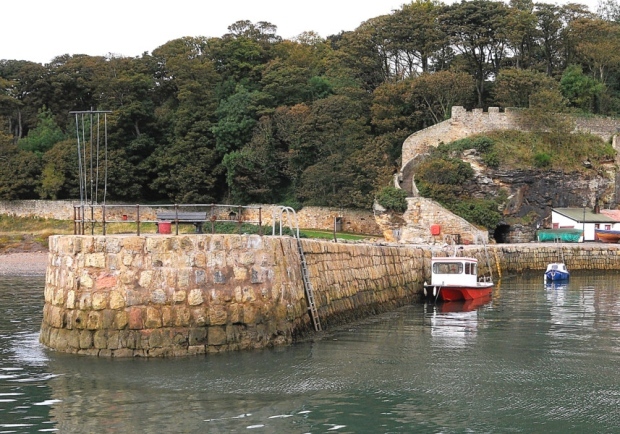 On Monday we head from Burntisland to Buckhaven with a special stop at Maggie’s Fife. 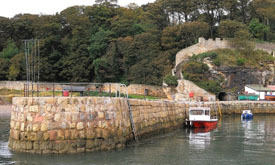 If you’d like to join us for a short walk – or the whole thing – please check our itinerary on www.bobswalk.co.uk – we’d be delighted to see you. If you wish to make a donation online please visit fundraise.maggiescentres.org/bobswalk – or simply help by sharing this link on your Facebook and Twitter accounts and any other social media or web forums you use. >> Sincere thanks to Gregg’s for supplying our packed lunches today – they were superb! >> On Twitter use the hashtag #bobswalk for updates on where wee are.